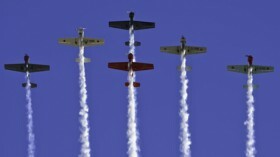 The 11th Windermere Air Show will be taking place on 23rd and 24th July 2011. There are lots of new exciting developments to this years event the first one being the new name the Windermere Air Festival! They will be bringing you so much more than just an Air Show in 2011, not only will you be wowed by the air displays you will also be able to take advantage of the free family activities on offer in the New Air Base! BREAKING NEWS: The Red Arrows have confirmed they will be attending this years’ Windermere Air Festival. They will be performing their full air display which is packed full of stunts, aerobatics and amazing formations. The Windermere Air Festival stands out from all the other air shows as it has the stunning backdrop of Lake Windermere and the Lake District National Park. If you wish to spend the night or weekend please contact our reservations department on +44 (0)1539 531133. The Whitewater Hotel is the ultimate Lake district retreat featuring the fantastic Cascades Leisure Club & Spa. Situated in the picturesque Lakeland Village, Backbarrow, just one mile south of the world famous Lake Windermere and nearby the Historic market town Ulverston. The hotel building itself is steeped in history; it was formally a Dolly Blue pigment factory making the world famous “Dolly Blue” and was also a Victorian cotton mill. Many artefacts have been preserved and the blue pigment is still evident throughout the building. The hotel today carries a 4 star rating with an award winning AA Rosette restaurant. The 38 luxury en-suite bedrooms nearly all enjoy stunning riverside views. This hotel really is the ideal place to escape from the fast pace of life for a few days and the perfect location to discover the sights and delights of the South Lakes and Cumbria.